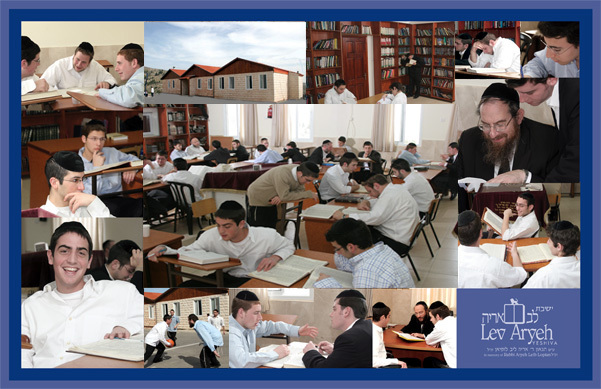 Lev Aryeh was founded by a group of experienced mechanchim who felt that there was a need to create a yeshiva for talmidim from the United States and other English speaking countries which would combine an emphasis on the primacy of high level Torah study and meaningful Jewish life with an intense program of developing positive character traits which personify the true “Ben Torah”. The founders of Lev Aryeh believed that a dedicated experienced faculty, a highly structured program of growth orientated shiurim, copious personal attention and a Beis Medrash with a warm atmosphere of encouragement, would all combine to facilitate the growth and development of each talmid according to his abilities. Lev Aryeh, opened it’s doors on Rosh Chodesh Elul 1994, with twelve students. It is located in the northern Jerusalem neighborhood of Neve Yaakov Mizrach which is a religious neighborhood of approximately one thousand families, thirty percent of whom are English speaking. The Yeshiva was initially housed in three apartments one serving as a Beis Medrash and the other two as dormitories, kitchen and dining room. As the Yeshiva grew between the years 1994-2004 the dining room-kitchen wandered from apartment to apartment. The Beis Medrash was housed in a trailer and the dormitories in rented apartments. Intensity of study is frequently taken to mean formality and a kind of rigidity. The hallmark of learning at Lev Aryeh is achieving that intensity and joy of learning and growth without rigidity or undue formality. While consistent discipline is required to master the techniques and skills of learning Torah, sensitivity to individual needs allow for the blending of this rigorous discipline with each individual’s character and learning abilities. The principle by which Lev Aryeh has such a dramatic effect on so many talmidim is by teaching them to learn Torah for themselves — by opening the door for them to enter the Beis Hamidrash, to sit with a gemara (or indeed any sefer) and a chavrusa and to learn Torah independently. Shiurim are kept small and the rebbi–talmid ratio is highly favorable. In the “Iyun Seder” the burden of preparing the gemara and essential “Rishonim” and “Achronim” is upon the talmid. Concurrently, ample opportunity is provided in the other sedarim to broaden the talmid’s “koach hachidush.” Talmidim are encouraged to say chaburos. Private tutors are provided to talmidim where necessary. The development of positive character traits essential to the true ben-Torah are achieved through personal guidance, mussar shmuessen, mussar vaadim, hashkafa shiurim and the study of sifrey mussar related to the different aspects of middos development. The fact that most of the faculty of Lev Aryeh live in close proximity to the Yeshiva and are accessible to the talmidim around the clock is an important component of the unique close relationship that exists in Lev Aryeh between faculty and talmidim.